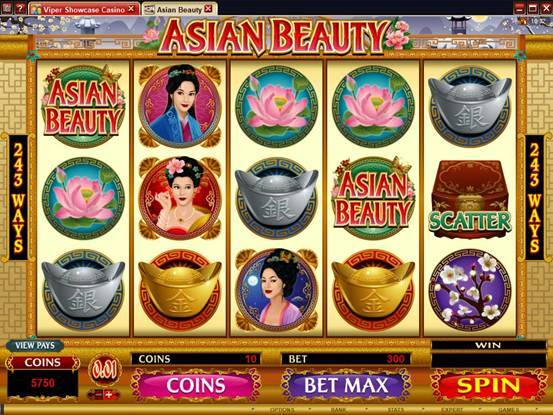 Asian Beauty Video Slot is a 5 Reel, 243 Way Video Slot, with a Wild substitute and a Scatter which triggers Free Spins. 3, 4 or 5 Scatter anywhere on the reels triggers 10, 15 or 25 Free Spins respectively. The Princess Bonus is randomly triggered in which the first 3 of a Kind Match wins the associated princess prize. You will find tenderness and exquisiteness in this elegant new Video slot Asian Beauty. Match these whimsical princesses in the Bonus round and reap the reward of their associated prizes. The Bonus is triggered randomly so look out for the waft of Lotus Petals for change in Climate and game temperature. 3 or more Treasure Chest Scatters will trigger up to 25 Free Spins in which all wins will be doubled. So travel East with Asian Beauty where royalty and beauty come together in a rewarding blend of grace and accolade. The timeless elegance and exquisite beauty of Asian princesses come together in Royal Vegas Casino's latest video slot, ASIAN BEAUTY. 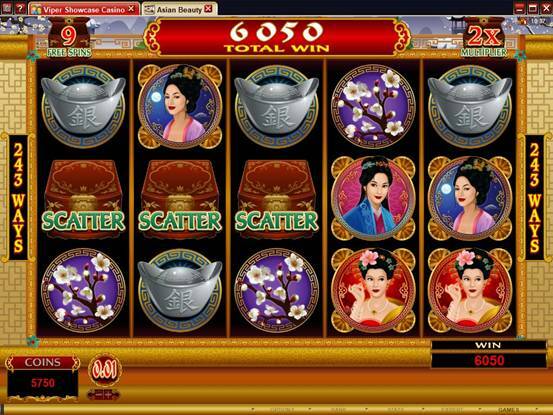 This 5 reel addition to the very popular 243 Ways-to-Win series of slots boasts a finely detailed oriental theme set by four graceful princesses among icons of the opulent lifestyle surrounding royalty, with richly embroidered clothing, lacquered treasure chests, antique porcelain and rare blossoms in secluded gardens, all depicted in vivid, high quality graphics. 3 or more of the master-crafted treasure chests across the reels act as the Scatter in this game, launching between 10 and 25 retriggering Free Spins which double all wins. These Scatter pays are multiplied by the players total bet and can also be remarkably generous as they range between 5x to 100x total bet. The emperor's daughters can also bring riches through the Mirror Bonus, which is triggered randomly within the game, ushering the player to a second screen hall of 12 mirrors surrounded by the four princesses against seasonal backdrops. 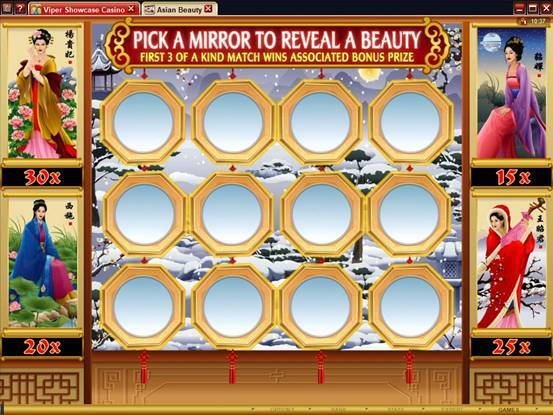 As the player clicks on each mirror it reveals one of the princesses, and the goal is to get three-of-a-kind to win their associated bonus prize. 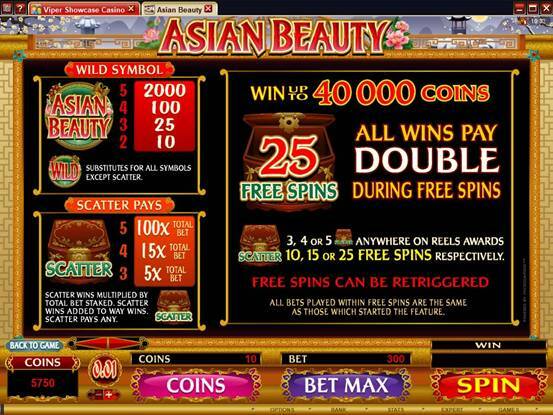 Completing an impressive range of opportunities is the Asian Beauty logo, which acts as the Wild in the game, helping players to build winning combinations. The maximum bet on the game is 150.00, and this advanced and richly featured slot can deliver up to 27 625.00 in the base game, double that in Free Spins. 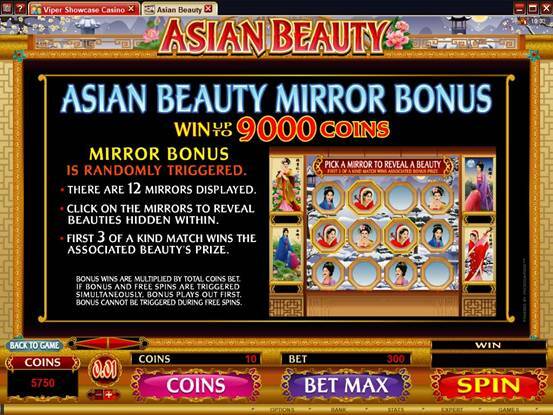 Asian Beauty is a true reflection of the best of the East, combined with great entertainment and opportunities to win....take it for a spin today at Royal Vegas Casino! Golden Tiger Casino Play Asian Beauty online slot with $1500 totally free. Without leaving your home you have access to over 456 Las Vegas style casino games including all the favourites such as blackjack, roulette, slots and video poker. State-of-the-art gaming software is the most advanced in the industry - the realistic graphics, exciting sound effects and smooth gameplay are truly unbelievable! The wide betting ranges make our casino games accessible to everyone from the novice right through to the experienced gambler.